Want to listen to most of your favorite college football bowl games on the go? 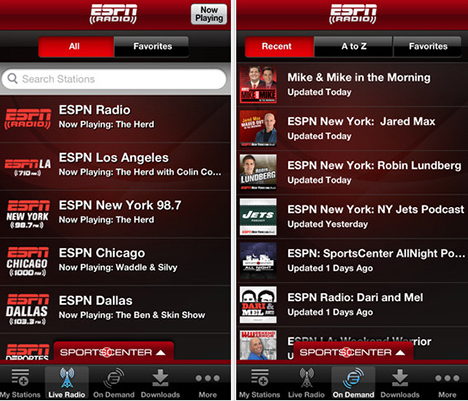 You’ll be able to do just that on you iOS and Android devices with the ESPN Radio app. ESPN is offering live audio streaming of every bowl game they broadcast (which is almost all of them!) via the ESPN Radio app. Other than the Sun Bowl (CBS), the Capital One Bowl (ABC), and the AT&T Cotton Bowl (Fox), every other College Football Bowl game will be broadcast by an ESPN network, and thus available to listeners through the ESPN Radio app. If you are wondering when your favorite game is being played, here is a full College Bowl game schedule. The schedule is topped off with the BCS National Championship (Florida St. vs. Auburn) game on January 6th. The ESPN Radio app has been updated with claims that it “vastly improves live streaming experience with fewer disconnects and more stable streams.” If true, this is good news as I’ve long found the app’s performance to be sub-par. So much so that I continue to use the TuneIn Radio app to listen to ESPN Radio as it’s streaming performance has always been superior to that of the ESPN Radio app. Since I’ve mentioned TuneIn Radio, it’s likely (unless ESPN blocks access) you’ll be able to find every bowl game via the TuneIn Radio app too. I suggest grabbing both and checking them out for yourself.